sequencing DNA at Broad Institute in Boston—we need to increase our capacity to serve them, and keep things running blazing fast. Today we’re announcing what will become our 15th global data center—we’re thrilled to be named new owners of the former Hemlock Semiconductor site in Montgomery County, Tennessee. When selecting any site, we look at the unique attributes and base our designs around them to build the most efficient and high-performing data centers possible. For example, our newest data center in Alabama, U.S. will be built on the site of a coal power plant, and in Hamina, Finland we built on an old paper mill and use seawater as the sole cooling mechanism. The Hemlock site was originally developed as a Semiconductor manufacturing plant, but unfortunately was never completed. We’ll be able to re-use much of the existing infrastructure, and will recycle and re-design what we don’t. Based on our assessments, this site will be able to house new technologies we’re currently testing in research & development, which would make this data center the most technologically advanced in the world. We are excited to again be working with the Tennessee Valley Authority (TVA), who will be our electricity provider at this site. Thanks to an arrangement with TVA we’ll be able to scout new renewable energy projects and work with them to bring that power onto their electrical grid; another step toward Google’s ultimate goal of being powered by 100% renewable energy. As the largest corporate energy purchaser in the world, we have signed 2 gigawatts of renewable energy supply contracts to offset the power used across our portfolio of data centers—equivalent to taking nearly 1 million cars off the road. It’s a real pleasure to be moving into this space, and to become a part of Montgomery County. 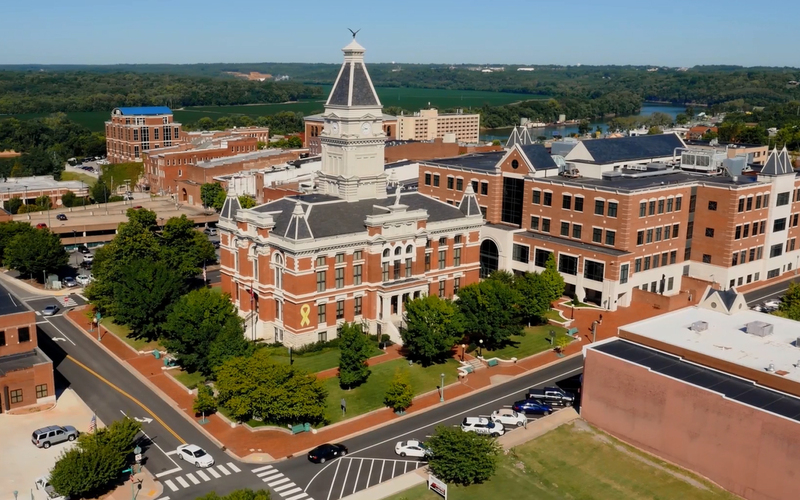 Total investments in this project will amount to more than $600 million, and we’ll start engaging with city and county officials to launch a formal community grants program around three issues: science and technology education, clean energy, and access to the Internet. While opening a data center can take years, we can’t wait to get to the drawing board to design the next internet engine in our lineup. Good things come to those who wait! Data centers are the engines of the Internet. As the next billion users come online—whether making payments from a mobile phone in Nairobi or sequencing DNA at Broad Institute in Boston—we need to increase our capacity to serve them, and keep things running blazing fast. the UN Climate Change Conference which resulted in 195 countries coming together to adopt the most ambitious climate change agreement in history. Roughly 40,000 people attended including 195 nations and thousands of NGOs and corporations. Over the past two weeks in Paris, Googlers have been discussing how sustainability has been making good business sense for us. We believe that strong action from the business community is critical to meeting the climate challenge. 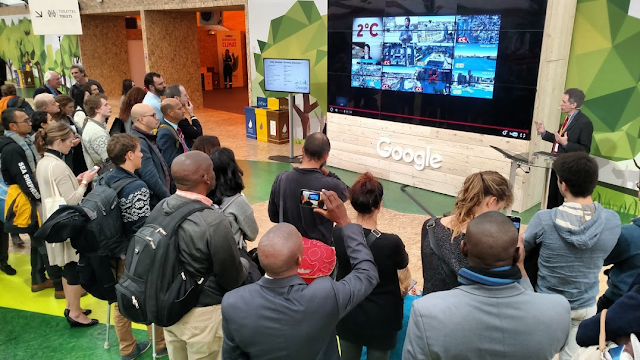 We were official sponsors of COP21 through the French Government, we co-hosted an event with RE100 and The Climate Group on the role of industry in driving renewable energy growth, and we showcased a Google immersive Portal display with rolling presentations of climate content from various partners! At our event with The Climate Group and RE100, we hosted leaders from government and business at our Paris office to discuss the role that companies can play in leading the way to a 100% renewable energy future. More than 60% of global Fortune 100 companies have set public renewable energy or GHG reduction targets not only because they believe in environmental sustainability but because they think that renewable energy makes good business sense. Leaders from Google, Ikea, Unilever, Marks & Spencer, and Philips Lighting discussed their business cases for purchasing renewable energy, and were joined by officials from the European Commission and the South Australian Government to focus on the role of government policy in unlocking private sector demand for renewables. To help showcase climate issues, the “Google Portal,” an immersive 9 screen, 3 x 3 meter square interactive display, was constructed in the public Climate Generations Area to allow people to explore and learn about their world, and to encourage public discussion. 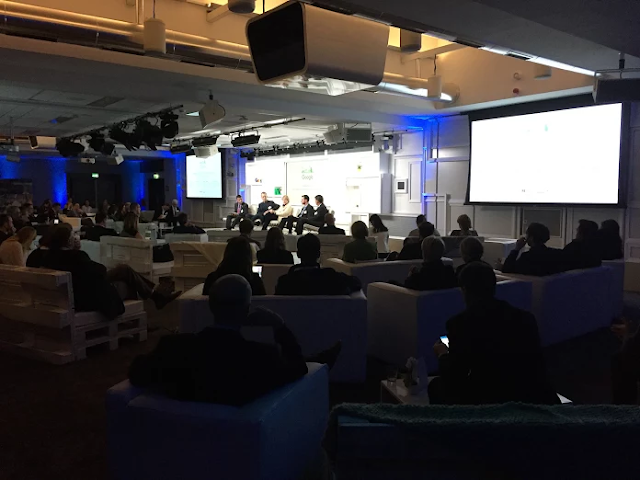 With 70 presentations, nonprofit demonstrations ranged from sea level rise by Climate Central, deforestation from Global Forest Watch and MapBiomas, coral bleaching from Underwater Earth and Sylvia Earle, and Climate Reality on the current state of climate changes. The Mayor of Paris, along with a broader coalition of mayors, presented their climate commitments before formal submission to the United Nations. The UN Food and Agriculture Organization discussed Collect Earth and land classification tool to enable country reporting and measurement and the EU Commission previewed the first look at a Global Water Surface map over the last 30 years. Google projects including Makani’s energy kites, the Earth Engine platform, a timelapse movie of the changing landscape, and YouTube’s #OursToLose campaign were shown. It's great to see a strong international climate agreement coming out of Paris that moves us towards a zero-carbon economy. Climate change is one of the most significant global challenges of our time. Rising to that challenge involves a complex mix of policy, technology, and international cooperation and Google is committed to doing our part. From November 30 through December 11, the French government hosted COP21 the UN Climate Change Conference which resulted in 195 countries coming together to adopt the most ambitious climate change agreement in history. Roughly 40,000 people attended including 195 nations and thousands of NGOs and corporations. Should you go solar? Just ask Project Sunroof. comes to an end this week, we’re expanding Project Sunroof, our online tool to help homeowners explore whether they should consider installing solar panels to reduce their energy costs, which we first launched in August. Starting this week, millions of homeowners across select metro areas in the most active solar states in the U.S., including California, Massachusetts, Arizona, New York, New Jersey, Nevada, Connecticut, Colorado and North Carolina, will be able to calculate their roof’s solar energy potential by using the same high-resolution aerial mapping technology used in Google Earth. Having this information will give you information on how to increase energy efficiency while cutting your monthly electric bill. To provide accurate estimates, Project Sunroof uses a unique set of data that assesses how much sunlight your roof gets, the orientation, shade from trees and nearby buildings, and local weather patterns—essentially creating a solar score for every rooftop that it maps. You can then provide your current average electricity costs and compare them to what you'd pay with solar. So not only can you learn whether your house is a good fit for solar panels, but you can also determine whether paying for installation will pay off in the long run -- in short, see the effect sunlight can have on your wallet. Solar installations today are growing rapidly (a system is installed every 2.5 minutes in the U.S.), but there remains tremendous untapped potential. In fact, only half a percent of U.S. electricity comes from solar power. According to GTM Research and the Solar Energy Industries Association’s U.S. Solar Market Insight Report, the US is on track for a record-breaking year, thanks to a booming residential photovoltaics market. By end of 2016, cumulative solar installations are poised to nearly double. Solar may help you cut costs while increasing efficiency. With Project Sunroof, you can more easily assess your home's solar energy potential—and help move us all toward a more renewable future. As the COP21 conference in Paris comes to an end this week, we’re expanding Project Sunroof, our online tool to help homeowners explore whether they should consider installing solar panels to reduce their energy costs, which we first launched in August. Starting this week, millions of homeowners across select metro areas in the most active solar states in the U.S., including California, Massachusetts, Arizona, New York, New Jersey, Nevada, Connecticut, Colorado and North Carolina, will be able to calculate their roof’s solar energy potential by using the same high-resolution aerial mapping technology used in Google Earth. Having this information will give you information on how to increase energy efficiency while cutting your monthly electric bill. of our Lenoir, North Carolina data center, we proposed a program with our electricity provider Duke Energy that would allow companies like Google to power their local operations with renewable energy. Today, we’re announcing that we have signed on as the first customer of the program and we will be purchasing energy from a 61 MW solar project in Rutherford County, North Carolina—enough energy to power almost 12,000 average U.S. households. By working closely with providers like Duke, we're now able to benefit from North Carolina's emerging solar energy industry and pave the way for other big customers to do the same. This is the first time that we're purchasing solar power in enough volume to power one of our data centers and it takes us another step towards our goal to eventually power 100% of our operations with renewable energy. The program, called the Green Source Rider, is beneficial because it allows companies to buy large amounts of renewable power directly from their utilities, with no additional costs to other ratepayers. We were an early advocate of such programs and are pleased to see they have been adopted in 10 states, from Virginia to Washington. As the largest corporate purchaser of renewable energy in the world, we (and our partners) want to encourage the countries and states in which we operate our data centers to add more renewable energy to their grids. To date, we’ve committed to purchase 1.2 gigawatts of renewable energy under long term contracts globally. The impact on emissions is the same as taking 590,000 cars off the road. We know that we have a lot more work to do. As we expand our efforts to additional regions where we operate, we’re looking forward to working with utility providers, developers of renewable energy projects, and other stakeholders. At a White House event in July, we made a public pledge to triple our renewable energy purchases for our data centers by 2025. So watch this space! In 2013, when we announced the expansion of our Lenoir, North Carolina data center, we proposed a program with our electricity provider Duke Energy that would allow companies like Google to power their local operations with renewable energy. Today, we’re announcing that we have signed on as the first customer of the program and we will be purchasing energy from a 61 MW solar project in Rutherford County, North Carolina—enough energy to power almost 12,000 average U.S. households. equivalent to 1.5 Earths -- clearly not a sustainable path. Our everyday actions can help shrink this oversize footprint -- through things like traveling more efficiently or using cleaner energy -- and we’ve built many tools to help make it easier. But companies should lead by example. That belief has propelled us to become the world’s biggest corporate purchaser of renewable power, a fully carbon-neutral company, and more. But we won’t stop there. Today we’re excited to launch a new partnership, with the UK-based Ellen MacArthur Foundation, whose mission is to accelerate the transition to a regenerative “circular economy” -- an economy that eradicates waste through smart design. In a traditional “linear” economy, waste is rampant: finite natural resources are taken from the Earth, made into products, and ultimately disposed. A circular economy creates a more lasting, closed-loop system: it reduces the use of finite resources, and focuses on ways to continuously cycle materials back into the economy -- like renewable energy resources and highly reusable materials. As the Foundation explains in the video below, the circular approach can offer big advantages for both the planet and the financial bottom line. Over the last five years, we’ve improved our data center operations and hardware to get 3.5 times the computing power out of the same amount of electricity. Turning waste into energy! At our main campus, we pipe in landfill gas from a local landfill to supply a portion of our electric and heating needs. Since 2007, we've repurposed enough outdated servers to avoid buying over 300,000 new replacement machines. As we’ve designed and constructed new buildings in the last year, our recycling of demolition waste and onsite materials kept more than 10,000 tons of material out of landfills. In addition to our large-scale composting program, we use a software system in our kitchens to track pre-consumer food waste (expired items, trimmings, etc.). At our Bay Area campuses alone, this system has prevented more than 170,000 pounds of food going into the waste stream over the past year. A growing number of our kitchens serve baked goods and other foods made with Coffee Flour, a flour derived from traditionally discarded parts of a coffee plant. At our Atlanta data center, our reuse water system enables us to use recycled wastewater from a local sewage treatment plant for our cooling needs. At our main campus, we invest in drought-resistant landscaping and irrigate with recycled water whenever possible. We’re on track for a 30 percent reduction in campus water use by the end of this year compared to 2013. Our partnership with the Ellen MacArthur Foundation will help us take our waste reduction and sustainability programs to the next level. Over the coming months, we’ll be working with the Foundation to explore and shape a series of initiatives to embed circular economic principles into the fabric of Google’s infrastructure, operations, and culture. Circle back with us in the coming year to hear more about where these projects take us and how they’ll support our ongoing commitment to the planet. Humankind is using up natural resources at an astonishing rate. Each year, our economy consumes far more than what the planet can naturally provide. Recent data shows that in 2015, society’s demand for resources will be equivalent to 1.5 Earths -- clearly not a sustainable path. Or a city planner could pinpoint areas of low air quality in her city and devise specific solutions to improve it. Seeing where and when the air quality is good or bad could help identify how to reduce pollution most effectively—like changing traffic light patterns to reduce idling traffic or keeping heavy trucks out of neighborhoods that are most vulnerable. Today at the 2015 Clinton Global Initiative Annual Meeting in New York, we’re announcing with Aclima that we will measure air pollution in more communities and map air quality at the street level. This follows our 2014 project with Environmental Defense Fund (EDF) to map methane leaking from natural gas local distribution systems, and our project to map multiple air pollutants in Denver with Aclima, which we announced in July. Now, we’re equipping Google Street View cars with Aclima’s air pollution sensing platform to measure and map air quality in at least three major metropolitan areas in California, including communities in the San Francisco, Los Angeles, and Central Valley regions. With 38 million residents and nearly 30 million registered vehicles, managing California’s air quality is among the most challenging problems in the United States. At high concentrations, particulate matter, black carbon, ozone, and other pollutants can trigger asthma attacks and make COPD worse. Worldwide, these pollutants lead to millions of premature deaths every year. These are the pollutants our cars will be measuring. Scientists working with Environmental Defense Fund (EDF) and other partners are already helping us determine how the equipped vehicles should drive in order to collect data more efficiently. We’ll make the data collected during our drives available on Google Earth Engine to scientists and air quality experts, including the EDF and others, who will help analyze and model the data with the goal of linking human health impacts to air pollution and exploring other applications at a community level. In the long run, our vision is to enable individuals, communities and policy-makers to make smart decisions to improve their health and our environment. By putting street-level air quality information overlaid on Google Earth and Google Maps, we’re making it more useful and actionable. And this, we hope, will lead to cleaner air. hundreds or even thousands of dollars per year on their electricity bill. But, as a volunteer with the Boston-based solar program Solarize Massachusetts and a solar homeowner myself, I’ve always been surprised at how many people I encounter who think that “my roof isn’t sunny enough for solar,” or “solar is just too expensive.” Certainly many of them are missing out on a chance to save money and be green. Google has always been a big believer in zero-carbon energy, and solar power has been a central part of that vision -- from accelerating the growth of rooftop solar, to helping finance the largest solar farm in Africa, to building one of America’s biggest campus solar arrays here in Mountain View. While Project Sunroof is in a pilot phase for now, during the coming months we’ll be exploring how to make the tool better and more widely available. If you find that your address isn’t covered by the tool yet, you can leave your email address and we’ll let you know when Project Sunroof is ready for your rooftop!